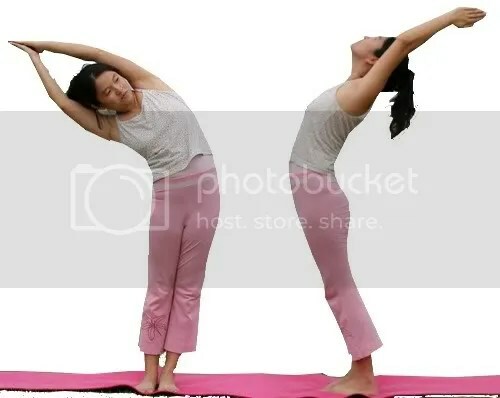 If you look at my Yoga teacher or even advance practitioner, their half/crescent moon is really bent at a 90degree.Â This is the maximum that I can go down.Â Don’t even start me on back bending.Â People like me with a bad back can’t really tolerate too much of back bending.Â Still a long way for me then. My kids always get excited whenever I lay out the yoga mat. I was thinking, maybe I should get another yoga mat for them since they like to kid around and I could have my peaceful practice at the same time. Here’s a picture of my no. 3 in downward facing dog. At the mean time, I refrained myself from teaching my kids yoga at home. I’ll let them watch and have a little fun not to the extend of teaching them cos they never had discipline and will not listen to my instruction which can be very dangerous and lead to injury. I will leave the task to a qualified teacher unless I know I am good. And I mean REALLY really good. This post somehow completed the warrior version of asana. Remember when I posted the pose on Warrior I, II & III? From Warrior II place the rear hand down the back of your tight. I would prefer to bend my arm a bit for back support. You should feel the stretches on your side oblique and lateral muscle. Practise this asana in a slow and graceful manners. I always feel like I’m swaying. Recently my colleagues (about 9 of them) enrolled in a private Yoga class paying RM100.00 for one hour session.Â Among the 9 of them, there is one who is deaf.Â Well, I know it is quite impossible for her but at the same time, I did not want to sound discouraging.Â All I can advise is, “make sure you sit on the center.Â No left, no right, no front, no back.Â Right smack on the center so that you can copy the others even though you can’t hear the instructions.”Â But of course, there are still many things that are disadvantage to her.Â I didn’t want to make too much negative comment.Â Just let her attend the class to find out herself what Yoga is about and decide later. Well, the next day, they group gave lots of positive comment and how they love Yoga.Â The only thing they are not happy about is the deaf colleague as they think that she (deaf) is slowing down the class and some of them have to explain to her in sign language in the middle of the asana.Â That really distract them.Â She (deaf) almost cried and blame herself on her handicap.Â I felt sorry for her too but there is nothing I could do. My Sister who is now in her third trimester of pregnancy was feeling rather uncomfortable and her movement was restricted as the day goes by. As the baby inside her gradually grow each days, she find herself quite uncomfortable when sleeping. You won’t understand how it feels if you are not a mother. Most of the time, she feels out of breath and need to be prop up with 2 pillows during sleeping time. But that can get very clumsy when sometimes you would prefer yourself sleeping lower and sometimes higher. Lately, she got herself a ‘S’ shape adjustable beds. The bed are shaped according to your body contour and the best part, it is adjustable with a press of a button. Not only that, the bed are equipped with a massage feature. That is great for me tho. I’m going to pop over at her place soon to try out the bed myself. Warrior pose is named after a mystic sage called Virabhadra.Â This pose help strengthen the legs and back muscle at the same time opens the chest and shoulder while toning the abdominal muscle. Whenever I am in this pose (warrior I & II), I will never forget to check out my toes.Â Yea, you should bend your knee at 90 degree (only!) and should be able to see all your 5 toes. Oh, and also not forgetting, “TUCK IN YOUR TAILBONE!! !”Â There you go.Â So many reminders. lol. Tiptoe pose is a challenging balance pose that develop and strengthens your knees and ankles.Â It also promotes overall balance, stability and confidence. For beginner, you may squat down and bring one leg up onto your tight.Â Find a balancing point.Â To come out from the pose, simply uncross your leg and sit down before stretching your leg out. For intermediate practitioner, you may start standing tiptoe in Tree pose by placing the foot on your tight instead of inner tight and come down to the floor in a forward bending. 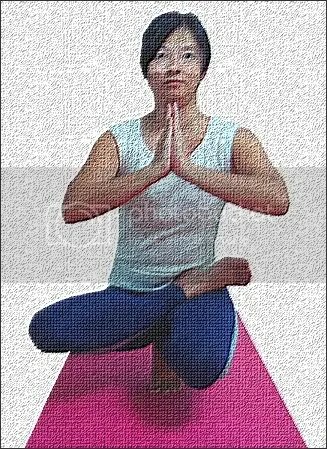 Squating down still on tiptoe.Â Find a focus point and once your body stabilized,Â place your palm in prayer pose. To come out from the post, lift your body up making sure you are still tiptoeing.Â Release leg onto the floor. This is what every women will ask once a month.Â I would say, it is a matter of personal preference and you should listen to your body. If you feel tired on the first or second day of the period, take sometime off.Â For women who do choose to practice, it is suggested that they avoid inverted poses like headstand or shoulder stand, abdominal strengtheners, extended holding of any pose, or energizing breaths like kapalabhati. The issue is that these practices might interfere with the downward of the menstrual flow or cause discomfort to the body. As what I have observed in my body ever since I started Yoga practice, the rate of the flow does increase on the first two days and the subsequent days is normal. It may stop at day 4 or day 5 unlike previously, it was dragged thru the whole week. One fine day as I was lazy to lay out the yoga mat, I decided just practice my headstand on the sofa chair. Oops, did I know the sofa is way too soft and watch what happen. My 3 kids almost have their jaw drop to the floor. We thought that is so hillarious and I did it once again so that we would record it down and post them here.